Urine output is widely used as a criterion for the diagnosis of AKI. Although several potential mechanisms of septic AKI have been identified, regulation of urine flow after glomerular filtration has not been evaluated. This study evaluated changes in urine flow in mice with septic AKI. The intratubular urine flow rate was monitored in real time by intravital imaging using two-photon laser microscopy. The tubular flow rate, as measured by freely filtered dye (FITC-inulin or Lucifer yellow), time-dependently declined after LPS injection. At 2 hours, the tubular flow rate was slower in mice injected with LPS than in mice injected with saline, whereas BP and GFR were similar in the two groups. Importantly, fluorophore-conjugated LPS selectively accumulated in the proximal tubules that showed reduced tubular flow at 2 hours and luminal obstruction with cell swelling at 24 hours. Delipidation of LPS or deletion of Toll-like receptor 4 in mice abolished these effects, whereas neutralization of TNF-α had little effect on LPS-induced tubular flow retention. Rapid intravenous fluid resuscitation within 6 hours improved the tubular flow rate only when accompanied by the dilation of obstructed proximal tubules with accumulated LPS. These findings suggest that LPS reduces the intratubular urine flow rate during early phases of endotoxemia through a Toll-like receptor 4–dependent mechanism, and that the efficacy of fluid resuscitation may depend on the response of tubules with LPS accumulation. AKI is a common clinical syndrome defined as a sudden onset of reduced renal function, characterized by a reduction of GFR and oliguria.1,2 The incidence of AKI has steadily increased over the last decade,3 and its mortality rate has remained high.4,5 Although basic research has identified several pathways involved in the mechanism of AKI, including inflammation6,7 and alterations in microcirculation,8,9 thus enabling the development of new therapeutic strategies, specific treatments that can improve AKI outcome are not yet clinically available.10–12 Notably, only modest histologic changes in the kidney gave been observed in patients with sepsis and in animal models of sepsis,13,14 whereas septic AKI has a high mortality rate. These results strongly underscore the need for further investigations of AKI by physiologic rather than by pathologic approaches. Oliguria is a criterion for AKI in several international guidelines (Acute Kidney Injury Network [AKIN], RIFLE, and Kidney Disease Improving Global Outcomes [KDIGO]).15–17 The reduction in urine output is thought to depend on GFR reductions in septic kidneys induced by hypoperfusion and/or intravascular depletion. Maintaining hemodynamics by fluid resuscitation and treatment with additional vasoactive agents, however, frequently fails to restore urine output. The mechanism by which urine output is decreased or halted, even when renal circulation appears to be normally maintained, has not yet been fully clarified. These issues led us to analyze the physiology of septic AKI in real time using intravital imaging and multiphoton microscopy.18–20 Intravital imaging is a technique that enables the real-time in vivo analysis of the intratubular urine flow rate after a bolus injection of freely filtered dye. This simple technique can directly measure the postglomerular urine flow rate in mouse kidneys and allows an evaluation of the contribution of the endotoxin LPS to the reduction of urine flow. To induce AKI, LPS (5 mg/kg, intraperitoneally) was injected into 8- to 12-month-old C57Bl/6 mice.21 LPS injection time-dependently increased BUN levels, while markedly reducing 24-hour urine output (Figure 1). LPS at this dosage did not significantly reduce either conscious BP during the first 8 hours after injection or BP under anesthesia 6 hours after injection (Supplemental Figure 1), confirming the subpressor dose previously reported.22 Subcutaneous intermittent fluid resuscitation (50 ml/kg saline) 4 and 18 hours after LPS23 normalized both 24-hour BUN and 24-hour urine output. Confirmation of AKI after LPS. (A) LPS time-dependently increases BUN, reaching statistical significance at 24 hours (n=4–10). Fluid resuscitation (subcutaneously, 1.5 ml at 4 and 18 hours) reduces BUN at 24 hours. (B) LPS decreases 24-hour urine output (n=4–6). Fluid resuscitation abolishes the decline of urine output after LPS injection. *P<0.05 versus saline. Visualization of peritubular capillary flow using FITC-conjugated 500 kD dextran or rhodamine B–conjugated 70 kD dextran showed the cessation of blood cell flow in capillaries 6 and 24 hours after LPS injection (Supplemental Figure 2, A–C). The number of capillaries showing microcirculation failure was time-dependently increased after LPS injection, and was not affected by fluid resuscitation (Figure 2D). The location of microcirculation failure strongly overlapped with mitochondrial membrane potential, measured using tetramethyl rhodamine methyl ester (TMRM),19,24 in the adjacent tubular walls (Supplemental Figure 2E). Estimation of renal function by in vivo imaging. (A) Representative pictures from time-lapse imaging after Lucifer yellow injection. In saline-treated mice, Lucifer yellow flows into all distal nephrons (arrows) that are in the focus plane within 50 seconds. By contrast, there are no distal nephrons exhibiting Lucifer yellow at 60 and 67 seconds after injection in LPS-treated mice at 6 and 24 hours, respectively. The distal nephrons with asterisks did not show Lucifer yellow within their lumens within 180 seconds. The horizontal dark lines at the lower and upper parts of the pictures are created by the respiratory movement of the living mice. (B) LPS time-dependently slows the time to visualize the distal nephron lumen (left). Fluid resuscitation does not improve the delayed tubular flow rate. The continuous recording is terminated at 300 seconds to avoid excessive phototoxicity, and the percentage of distal nephrons that did not show Lucifer yellow in the lumen within 300 s is shown on the right side (n=7–10). *P<0.05 versus saline. The urine flow rate was estimated by timing the appearance and disappearance of injected fluorescent dyes in distal nephron segments. In nonseptic mice, both FITC-inulin and Lucifer yellow flowed into distal nephrons within 60 seconds of a single bolus injection into the jugular vein (Figure 2A, Supplemental Figure 3, Supplemental Movie 1) and were cleared from these nephrons within 300 seconds. The time of visualization of distal nephron lumens using Lucifer yellow was increased 2 hours after LPS injection (5 mg/kg, intraperitoneally) and was further delayed in a time-dependent manner (Figure 2B). Lucifer yellow in distal nephron lumens was not yet cleared 600 seconds after injection into mice 6 and 24 hours after LPS treatment. In some nephrons, Lucifer yellow was retained in the proximal tubular lumens and did not appear in distal nephron lumens within 300 seconds. The percentage of distal nephrons without Lucifer yellow in their lumens within 300 seconds was also time-dependently increased after LPS injection (Figure 2B). Intermittent subcutaneous fluid resuscitation did not significantly ameliorate the delayed Lucifer yellow flow rate 24 hours after LPS injection (Figure 2B). LPS injection also significantly reduced the flow rate of urine, which was collected through a bladder catheter. During a 90-minute collection period, from 6 to 7.5 hours after saline injection, the flow rate of urine in anesthetized saline-treated normal animals was 93±6 μl/h (n=3). By contrast, during two 90-minute collection periods (6–7.5 hours and 24–25.5 hours after LPS injection), no urine was collected from LPS-treated mice, even with fluid resuscitation (subcutaneously; n=3 per time point). LPS did not reduce whole kidney GFR, as measured by plasma decay kinetics of FITC-inulin (intravenous bolus), at 6 hours but did so at 18 hours (Supplemental Figure 4). We next investigated the relationship between the local effects of LPS in the kidney and the reduction of tubular flow rate in mice injected with Atto565-conjugated LPS (Atto565-LPS). Within 20 minutes of intraperitoneal injection, Atto565-LPS accumulated on the apical membrane side of proximal tubules (Supplemental Figures 5 and 6). Importantly, the Lucifer yellow flow rate was selectively reduced in proximal tubules that accumulated Atto565-LPS (Supplemental Movie 2). In severe cases, Lucifer yellow remained in the proximal tubules >5 minutes after LPS injection, with Lucifer yellow being highly colocalized with Atto565-LPS (Figure 3A). The reduction of the flow rate in proximal tubules was evaluated by calculating Lucifer yellow inflow and outflow times in these tubules. For example, 6 hours after LPS injection, Atto565-LPS–labeled tubular lumens were filled with Lucifer yellow within 4 seconds, comparable with findings in saline-injected mice (Figure 3B). There was no significant difference in inflow times between Atto565-labeled proximal tubules in LPS-injected (6.0±0.4 seconds; n=24 tubules in six mice) and saline-injected mice (5.1±0.3 and 5.6±0.3 seconds in S1 and S2 segments, respectively; n=27 and n=26 tubules in seven mice). This suggests that the contribution of GFR reduction to urine flow rates is minimal at this phase. Rather, Lucifer yellow was retained longer in the proximal tubules that accumulated Atto565-LPS than in those of saline-injected mice (Figure 3C). Tubular flow is slowed in the proximal tubules that accumulate LPS. (A) Lucifer yellow (LY) (green-yellow) retained in the LPS-accumulated proximal tubules (red). (B) The time to fill the tubular lumen by Lucifer yellow is similar between normal (nonlabeled S2 segment of proximal tubule in saline-treated mice) and Atto565-LPS–labeled (right panels) tubules. Pictures taken every 2 seconds after Lucifer yellow injection. (C) The upper graph shows that inflow time of Lucifer yellow is similar between normal (both S1 and S2 segments of proximal tubules in saline-treated mice) and Atto565-LPS–labeled tubules, whereas the outflow time is prolonged in Atto565-LPS–labeled tubules only (n=24–27 tubules in 6–7 mice). The lower graph shows the representative curve for the time-course changes in fluorescence intensity (in the “green” channel) in the lumen of the normal and Atto565-LPS–labeled tubules. Inflow time is started measuring from the time showing >1000 of fluorescence intensity increase (12-bit images) per second to the time showing the peak fluorescence intensity. Outflow indicates the duration required to halve the fluorescence intensity of the peak reading. *P<0.05 versus the other three groups. We also analyzed the colocalization of microcirculation failure and accumulation of Atto565-LPS in proximal tubules (Supplemental Figure 7). However, we failed to detect any consistent colocalization between Atto565-LPS in proximal tubules and microcirculation failure in peritubular capillaries at either 6 or 24 hours. Interestingly, the proximal tubules that were strongly positive for Atto565-LPS often showed narrowing of the tubular lumen 24 hours after injection (Figure 4A), as well as a marked reduction in the Lucifer yellow flow rate, with Lucifer yellow not cleared from the lumen of any of these tubules within 300 seconds. Narrowing of the tubular lumen in tubules that had accumulated Atto565-LPS was accompanied by proximal tubular cell swelling (Figure 4B). Cell swelling in the obstructed tubules at 24 hours after LPS injection (n=6). (A) The proximal tubules, which show strong LPS accumulation, have narrowed lumens (upper image). LPS accumulation is visualized by Atto565-derived fluorescence with 860 nm laser (lower image). (B) No significant difference in the diameters is observed between tubules in saline-treated mice and nonlabeled tubules in LPS-treated mice. There is a decrease in lumen diameter and an increase in cell height, but not outer diameter, in Atto565-labeled LPS. *P<0.05 versus saline. 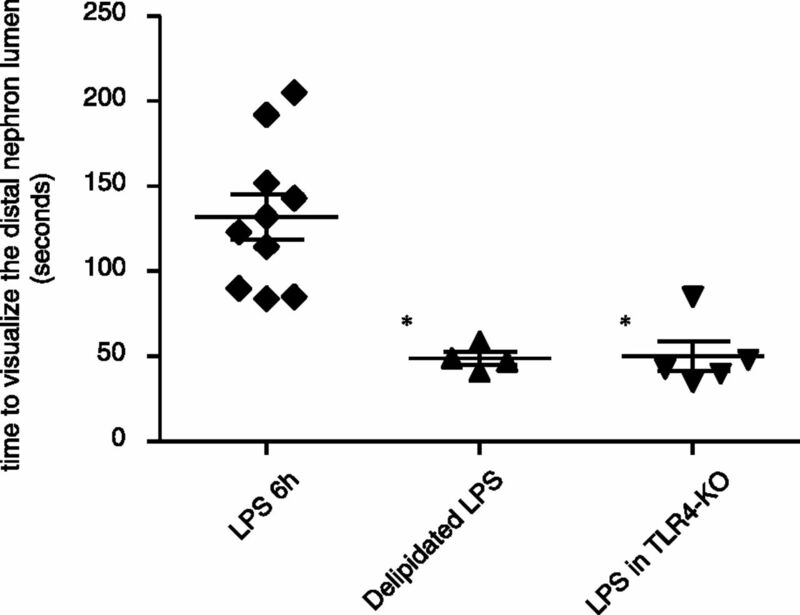 LPS is known to induce inflammatory responses through Toll-like receptor 4 (TLR4).25,26 Lipid A constitutes the binding site of LPS to the receptor complex, which consists of TLR4, CD14, and MD-2.27,28 Injection of delipidated Atto565-LPS did not induce narrowing of the tubular lumen or Atto565 accumulation in proximal tubules. 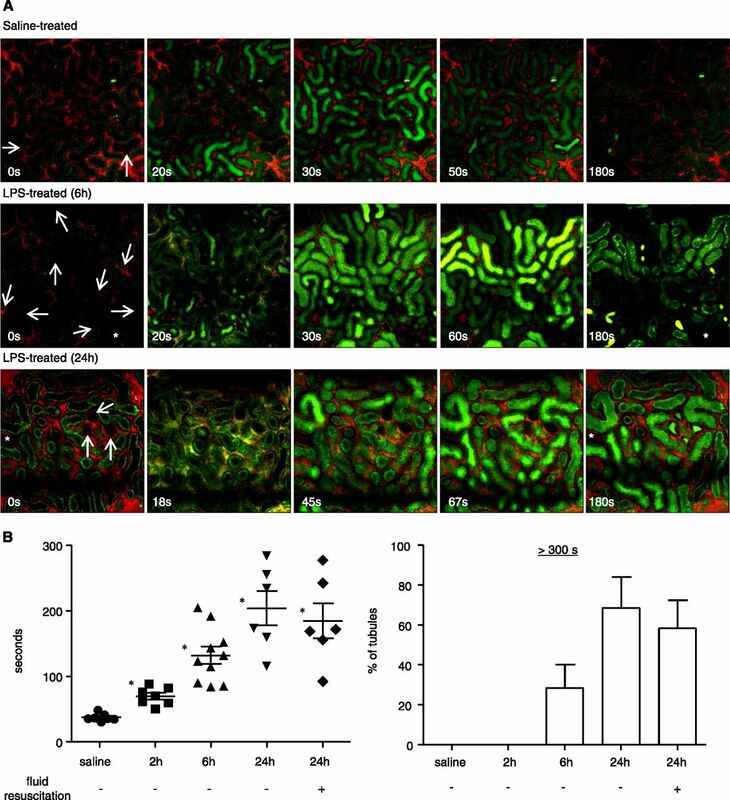 Real-time imaging showed that clearance of delipidated Atto565-LPS from the tubular lumen was comparable to that of free dye (Supplemental Figure 8). Importantly, the reduction of the Lucifer yellow flow rate was markedly attenuated in mice injected with delipidated LPS and in LPS-treated TLR4-knockout (KO) mice (Figure 5). LPS-induced reduction of the tubular flow rate is induced through lipid A–dependent and TLR4-dependent pathways (n=4–10). LPS that had its lipid A component removed is not accumulated in the kidney and does not slow Lucifer yellow flow. In addition, Lucifer yellow flow is remarkably faster in TLR4-KO mice than in LPS-treated C57Bl/6 mice. The data from the “LPS 6h” group in Figure 2B are also used in this graph. *P<0.05 versus LPS 6h. The injection of recombinant mouse TNF-α (mTNF-α; intravenously, 40–80 μg/kg) did not slow the Lucifer yellow flow rate 6 hours after LPS injection (Figure 6), even at a dose (80 μg/kg) that induced a 20-fold greater plasma TNF-α concentration than LPS (5 mg/kg) 2 hours after injection (18.64±2.63 versus 0.78±0.09 ng/ml; n=3 and n=4, respectively). In addition, neutralizing mTNF-α antibody (1 mg/kg, intraperitoneally) did not significantly ameliorate the LPS-induced reduction in the Lucifer yellow flow rate (129±22 seconds with 38%±22% of tubules showing >300 seconds; n=5) (Figure 6). LPS-induced reduction of tubular flow rate is induced through a TNF-α–independent pathway (n=3–10). Exogenously administered recombinant mouse TNF-α does not slow Lucifer yellow flow. 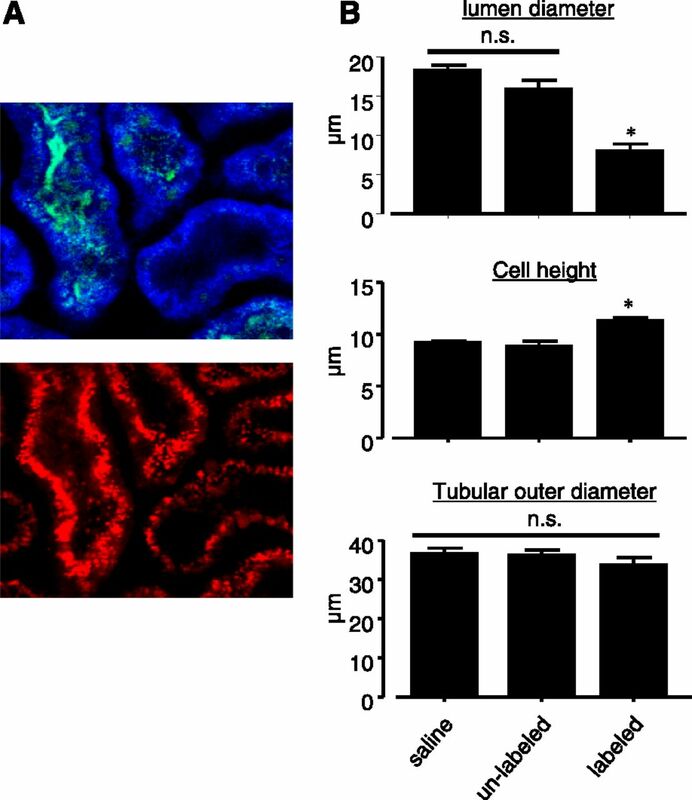 In addition, neutralizing TNF-α by anti–mouse TNF-α antibody does not affect Atto565-LPS accumulation in the proximal tubules or reduction of the Lucifer yellow flow rate. The data from the “LPS 6h” group in Figure 2B are also used in this graph. Ab, antibody. *P<0.05 versus LPS 6h. Because the effect of intermittent subcutaneous fluid resuscitation (1.5 ml of saline 4 and 18 hours after LPS injection23) on the tubular flow rate at 24 hours was minimal (Figure 2C), we further investigated the effects of continuous intravenous fluid resuscitation (30 ml/kg at 50 μl/min) on the tubular flow rate. Tubules that did not accumulate Atto565-labeled LPS were more easily dilated in response to intravenous fluid resuscitation than were tubules that accumulated Atto565-labeled LPS, both at 6 and 24 hours. The response of tubular lumen diameter to fluid resuscitation was scored from 1 (mildest) to 4 (most severe) (Figure 7A, Supplemental Figure 9). Tubule dilation was greater when fluid resuscitation was started at 6 hours than at 24 hours (Figure 7B). Mice with dilated Atto565-labeled tubules (scores 1 and 2) showed improved Lucifer yellow flow rates of <160 seconds after fluid resuscitation (Figure 7C), whereas the mice with more severe scores (scores 3 and 4, with no response in Atto565-labeled tubules) showed no Lucifer yellow in the distal nephron lumen within 600 seconds, even after fluid resuscitation. These findings suggested that dilation of Atto565-labeled tubules could determine whether the tubular flow rate improved significantly after fluid resuscitation. Difference in the responses to intravenous continuous fluid resuscitation between LPS-accumulated and nonaccumulated tubules. (A) Definition of score for the responses to fluid resuscitation. The mice that do not have tubular obstruction before fluid resuscitation (intravenously, 30 mg/kg) and respond (having an increase in lumen diameter) to fluid resuscitation are given score 1. The mice that do not respond to fluid resuscitation are given score 4. (B) The score is time-dependently increased after LPS injection. (D) Three mice with scores 1 and 2 show Lucifer yellow in the distal nephron lumen within 300 seconds after fluid resuscitation, and the times are reduced compared with the times before fluid resuscitation. #This value is from the mouse that did not show Lucifer yellow in the distal lumen within 300 seconds before fluid resuscitation. The mice at score 3 and 4 do not show Lucifer yellow in the distal nephron within 600 seconds, even after the fluid resuscitation. The biologic mechanisms underlying septic AKI have been found to include irregular peritubular capillary flow,29,30 disturbances in oxygen supply,9 and mitochondrial dysfunction.31,32 Less is known, however, about the mechanisms underlying oliguria, despite it being a diagnostic criterion of AKI in several guidelines (e.g., AKIN, RIFLE, and KDIGO).15–17 To our knowledge, this study is the first to show that (1) LPS signaling through a TLR4-dependent mechanism is associated with reduced intraproximal tubular urine flow rate and (2) the dilation of LPS-containing tubules in response to fluid resuscitation may distinguish urine flow rate responders and nonresponders during early phases of endotoxemia in mice. Inasmuch as the tubular flow rate was reduced when BP or GFR was maintained, hypotension or reduction in GFR was likely not the primary factor initiating oliguria. 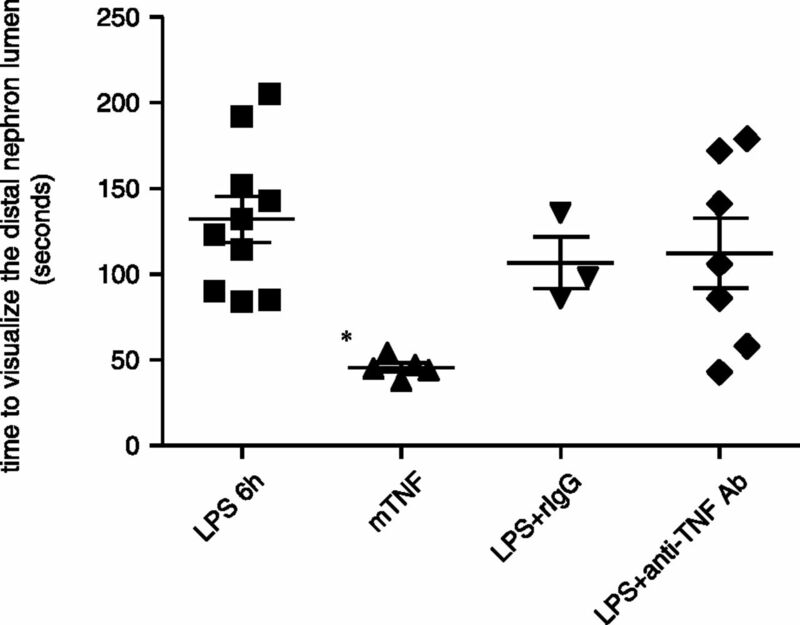 Rather, LPS may have reduced the tubular flow rate during early phases of sepsis by postglomerular regulation of urine flow through a lipid A/TLR4–dependent and TNF-α–independent mechanism. The mechanism by which LPS/TLR4 reduces the tubular flow rate remains unclear. Cell swelling and tubular obstruction were observed in some tubules that had accumulated LPS during relatively late phases of sepsis, with all of these tubules showing a markedly slower flow rate. However, many tubules showed a reduction in the Lucifer yellow flow rate without cell swelling or tubular obstruction. 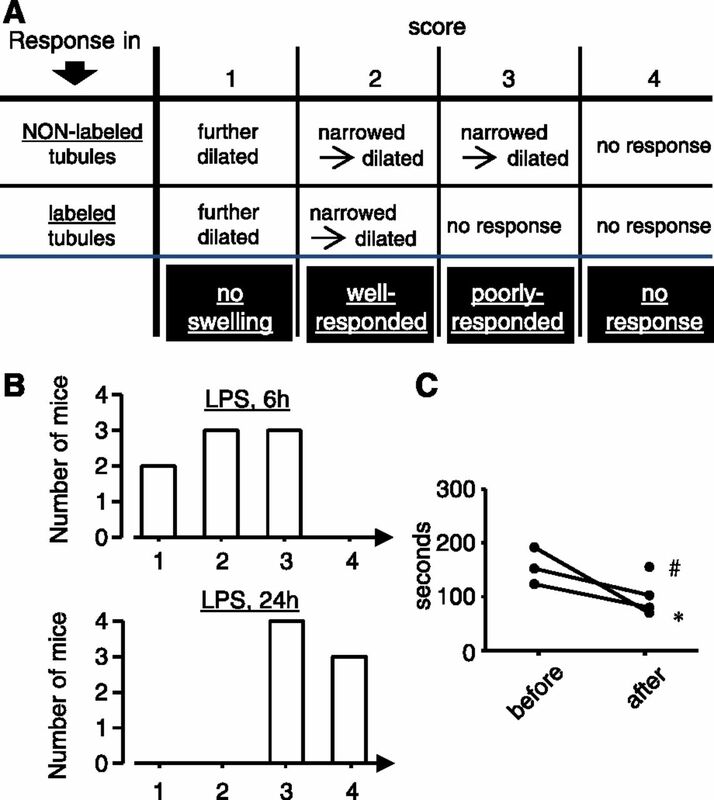 In addition, intravenous fluid resuscitation in mice with scores of 1–2 showed only partial amelioration of the Lucifer yellow flow rate, albeit with a marked increase in tubular lumen diameter, suggesting that LPS-induced cell swelling and tubular obstruction are only partially responsible for the reduction in tubular flow rate. Alternatively, tubular fluid may permeate the proximal tubular epithelial barrier into the interstitial space and return to the systemic circulation, possibly through lymphatic vessels. LPS, however, has been reported to reduce the expression of NHE3 and other channels for solute reabsorption in tubules.33,34 Another possibility is paracellular back-leak due to alterations in the actin cytoskeleton and the disruption of tight junctions.35 This leakage may occur only at the electrolyte level (i.e., water or sodium ions), because paracellular leakage of larger molecules, such as FITC-inulin and Lucifer yellow, was not observed. Using conditional KO mice (e.g., renal tubule–specific TLR4 KO mice) in combination with yet undeveloped advanced imaging techniques that enable the visualization of paracellular (or intracellular) ion leakage may more directly clarify the (molecular) mechanism. Lucifer yellow was retained in the distal nephron lumen (distal tubules and cortical collecting ducts) longer in LPS-injected mice than in saline-injected mice. This slower distal tubular flow could stimulate the tubuloglomerular feedback system36,37 and increase the GFR of each nephron, thereby adjusting the “inflow” rate in the proximal tubules during early phases of endotoxemia. Fluid resuscitation is a required treatment for septic patients. Although intermittent subcutaneous fluid resuscitation normalized both BUN and 24-hour total urine output in LPS-injected mice, it did not affect microcirculation failure or tubular flow rate at 24 hours. The effect of fluid resuscitation may therefore be transient, because no increase in urine flow rate was observed in fluid-injected mice at 24 hours using intravital microscopy or direct collection of urine for 30 minutes using a bladder catheter. By contrast, the response of tubular flow to fluid resuscitation at the end of infusion was found to depend on the response of LPS-containing tubules, which was time-dependently worsened. This proviso on the response to fluid resuscitation may be associated with the fluid overload conditions in AKI.12,38–40 Fluid resuscitation in participants with scores of 3 or 4 may induce positively balanced fluid retention because of strongly exaggerated output. Indeed, better responses to intravenous fluid resuscitation were observed at 6 hours than at 24 hours after LPS injection. This finding confirms the benefits of earlier initiation of fluid resuscitation, although the precise mechanism by which tubules that accumulated LPS became unable to respond to fluid resuscitation has yet to be elucidated. Both reduction of GFR and cell swelling may be the causes of tubular obstruction. Because whole kidney GFR was reduced at the time of cell swelling (24 hours), the reduction in fluid delivery to the observed tubular lumen may reduce intraluminal pressure. This, in turn, may enlarge cell height by creating negative pressure. On the other hand, tubular obstruction as a result of cell swelling could increase the hydrostatic pressure at Bowman’s capsule of glomeruli and reduce GFR. Importantly, we demonstrated that the primary cause of oliguria is tubular flow retention in the proximal tubules, rather than tubular obstruction that started during the early phase of endotoxemia (approximately 2 hours). The tubular obstruction is likely a secondary response. Extrarenal TLR4 and increased TNF-α are associated with increased BUN and the progression of kidney damage after LPS injection in mice.43–45 By contrast, we found no evidence that TNF-α contributes to the LPS-induced reduction in tubular flow rate. This discrepancy may result from differences in experimental settings, such as mouse age and strain, as well as LPS dosage. Alternatively, the responses of renal function markers, such as BUN, and oliguria may be two independent features induced by different mechanisms in endotoxemic kidneys. Real-time urine flow monitoring using intravital 2-photon microscopy showed the physiologic importance of renal LPS activity in reducing the urine flow rate, possibly mediated by LPS accumulation in the proximal tubules. These findings, on the physiologic mechanism of oliguria in septic AKI, may enable the development of new therapeutic strategies against septic AKI. Rhodamine B–conjugated 70 kD dextran, FITC-conjugated 500 kD dextran, TMRM, and Lucifer yellow were purchased from Invitrogen (Life Technologies, Carlsbad, CA). FITC-inulin was purchased from TdB Consultancy AB (Uppsala, Sweden). LPS (O-55; Sigma-Aldrich, St. Louis, MO) was conjugated to Atto-565 NHS ester (Sigma-Aldrich) according to the manufacturer’s instructions. Unconjugated free dye was removed using Amicon ultra centrifugal 3k filters (EMD Millipore, Billerica, MA). Aliquots were stored at −80°C until use. All experimental procedures were performed according to the guidelines for the care and use of animals established by Kagawa University. Male C57/BL6J mice were purchased from CLEA (Tokyo, Japan) and housed in our colony until they were of proper age. All TLR4-KO mice were from our breeding colony.46 LPS was injected intraperitoneally and in vivo imaging was performed 2, 6, or 24 hours later. A separate group of animals received fluid resuscitation 4 and 18 hours after LPS injection (50 ml/kg saline, subcutaneously) and evaluated by in vivo imaging at 24 hours. The mice were anesthetized with 2% isoflurane (Mylan, Osaka, Japan). After tracheotomy, the jugular vein was cannulated for fluorescent dye injection and for infusion of maintenance fluid, consisting of 1.0 μl/min of 2% albumin in PBS. The left kidney of each mouse was exteriorized through a small flank incision and attached to a coverslip. The microscope stage and animals were warmed using a heating pad during all experimental procedures. Intravital multiphoton microscopy was performed using an Olympus FV1000MPE multiphoton confocal fluorescence imaging system (Olympus, Tokyo, Japan), powered by a Chameleon Ultra-II MP laser at 720 and 860 nm (Coherent Inc., Santa Clara, CA). The microscope objective was a ×25 water immersion lens with a 1.05 numerical aperture. The imaging settings for the microscope (gain and offset for all three channels; blue, green, and red) were fixed throughout the experiment. After a 30-minute recovery period, three-dimensional z-stack images were taken at depths of 5–50 μm (1 μm apart) from the surface of the kidney or two-dimensional time-lapse images were taken 25 μm from the surface of the kidney. In some groups of animals, catheters were inserted into the carotid artery or bladder in addition to the above-described experimental protocol. Carotid arterial pressure was monitored using a PowerLab data acquisition system (AD Instruments, Dunedin, New Zealand) 6 hours after LPS injection. Bladder urine was collected from either saline-treated nonendotoxemic mice or LPS-treated mice receiving fluid resuscitation. Urine collection was started at 6 hours in saline-treated mice and LPS-treated mice and at 24 hours in LPS-treated mice that received subcutaneous fluid resuscitation 4 and 18 hours after LPS injection. After obtaining z-stack images from mice, with excitation at 720 and 860 nm without exogenous fluorescent dye, rhodamine B–70 kD dextran was injected to visualize peritubular capillaries. To minimize fluid loading, the volume of each dye injected was set at 100 μl per 25 g body wt. To assess the colocalization of Atto565-conjugated LPS and microcirculation failure, FITC–500 kD dextran was injected instead of rhodamine B–70 kD dextran to avoid the overlapping of fluorescence from Atto565 and rhodamine B. Capillaries that showed a 1-minute cessation of blood cell flow were defined as having microcirculation failure. TMRM (10 μg/kg, intravenous bolus) was subsequently injected to visualize mitochondrial membrane potential,24 with images obtained 3–5 minutes after TMRM injection because at later times, TMRM is secreted from proximal tubular cells and the fluorescence intensity is markedly attenuated. After obtaining z-stack images from mice, with excitation at 720 and 860 nm without exogenous fluorescent dye, Lucifer yellow (100 μg/kg, intravenous bolus) or FITC-inulin (16 mg/kg, intravenous bolus) was injected to visualize tubular fluid flow. Time-lapse images were obtained at a resolution of 512×512 pixels. The “labeled” tubules were defined as those with an intensity of Atto565-derived red fluorescence >3-fold higher than the intensity of green tubular autofluorescence in the tubular wall. The inflow time of Lucifer yellow was defined as the time with >1000-fold increases in fluorescence intensity (12-bit images) per second to the time showing peak fluorescence intensity, whereas outflow time was defined as the time from peak to the one-half peak of fluorescence intensity. Inflow and outflow times were measured in three to four spatially separated tubular lumens in each imaging window that showed Lucifer yellow at a similar time point. The S1 and S2 segments of proximal tubules were defined based on the kinetics of FITC-inulin and the autofluorescence pattern, as previously reported.18 Because labeled LPS disturbs the autofluorescence, this separation into S1 and S2 segments was not applied to LPS-treated mice. Diameters of tubules were measured from images taken by a 720-nm excitation laser, with the outer diameter measured from three-dimensional–composed images, the inner diameter measured from x-y images showing the longest lumen in each tubule, and cell height measured from x-y images showing each nucleus. Diameters were measured in at least 15 tubules per mouse. Animals received fluid resuscitation (30 ml/kg, 50 μl/min) 30 minutes after the first measurement of the tubular flow rate, followed by reinjection of Lucifer yellow. Twenty-four–hour urine samples were collected after mice were acclimated in the metabolic cages for 24 hours. Plasma urea nitrogen level was measured using commercially available assay kits (Urea nitrogen B test; Wako, Osaka, Japan). Total GFR was measured by plasma decay kinetics of FITC-inulin.47,48 A bolus of around 4 μl/g body wt FITC-inulin was injected into the retro-orbital plexus of either vehicle-injected mice or LPS-injected mice, and blood was collected 1, 3, 5, 10, 15, 35, 55, and 75 minutes later. Plasma fluorescence was measured using a microplate reader (SH-9000; Corona, Ibaraki, Japan). Inulin concentration was measured using a two-phase exponential decay curve, with the clearance calculated using an FITC-inulin standard. Telemetry transmitters (Data Sciences, St. Paul, MN) were implanted into mice under isoflurane anesthesia, as described by the manufacturer. Briefly, the left carotid artery of each mouse was briefly occluded to allow insertion of the transmitter catheter, which was fixed in place with a 6-0 silk suture. The transmitter body (TA11PA-C10) was placed in the subcutaneous space between the skin and left abdominal muscle. Mice were allowed to recover from surgery and returned to individual housing for at least 1 week before the start of data acquisition. Mice were given 3 mmol/L of acetaminophen in their drinking water for 3 days after surgery. Individual mouse cages were placed on top of the telemetry receivers and arterial pressure waveforms were continuously recorded. Results are expressed as means±SEM. Statistical significance was assessed using one-way ANOVA followed by Tukey’s multiple comparison test. Means in two groups were compared using t tests. All statistical analyses were performed using GraphPad Prism 5 software (GraphPad Software Inc., La Jolla, CA), with values of P<0.05 considered statistically significant. This work was supported by a Grant-in-Aid for Young Scientists (B) from the Ministry of Education, Culture, Sports, Science and Technology of Japan (23790299 to D.N.). This article contains supplemental material online at http://jasn.asnjournals.org/lookup/suppl/doi:10.1681/ASN.2014060577/-/DCSupplemental.